Bring your friends together for a cause. Raise Funds and have FUN. Marathon runners, PTO's, non-profits, raising funds for a charitable cause? ...raises money for colon cancer research. Haven't painted since middle school? Welcome to the club! Forgotten how to use the left side of their brain. No worries! There is lots of mingling and lots of peer to peer encouragement. Look at the event gallery to get a sense of how others have interacted. It comes down to a fun time and new connections. Masterpiece Art Bar believes in supporting our local community and charities serving the greater good. To that end, we offer discounted rates per person and will work with you to set rates that will help your charity generate funds and friends. We see this type of event as an opportunity to “Friend-raise” as it is a happy atmosphere and they get to learn more about you while in the company of their friends. The charity is not limited by Masterpiece Art Bar from adding features to the event that will generate more funds and we do not take a cut from those efforts. Examples of additional activities are: raffles, giveaways and celebrity guests. If you are not a recognized 501 (c)3, you must show that the purpose of the party is charitable. 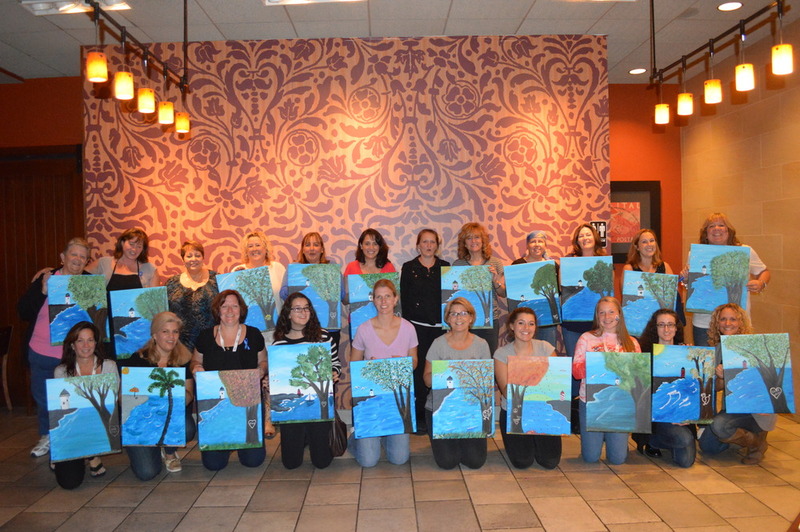 For private events, you choose the painting. If we don’t have something you like, we will work with you to create something you like and that others will be able to paint with no experience. *Having fewer than 20 people is negotiable, but can affect the level of discount.